A version of the traditional 'cure everything' soup. It's light, tasty, and comforting, and of course contains no chicken. I love this soup. I just wish they had a lower sodium version. Must have 2 cans in the pantry at all times! It is not only delicious but soothing and nurturing as a "chicken" soup should be. This has been a favorite for over 10 years! 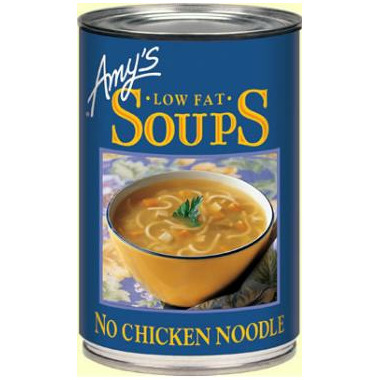 This is our favourite Amy's soup at the moment. Good hearty flavour. My husband thought it was real chicken! I ordered this once and never got to try it because the can came dented. From now on I'm not ordering canned items through Well.ca. I really like this soup! I have one or two cans every week.